Fireworks lit up the sky as the celebrity couple exchanged vows on Saturday in a Christian ceremony at the opulent Umaid Bhawan Palace in Jodhpur, in the western desert state of Rajasthan. They were joined in the fabled “Blue City” by their families, including Jonas’s brother Joe Jonas and his fiancee, British actress and “Game of Thrones” star Sophie Turner. 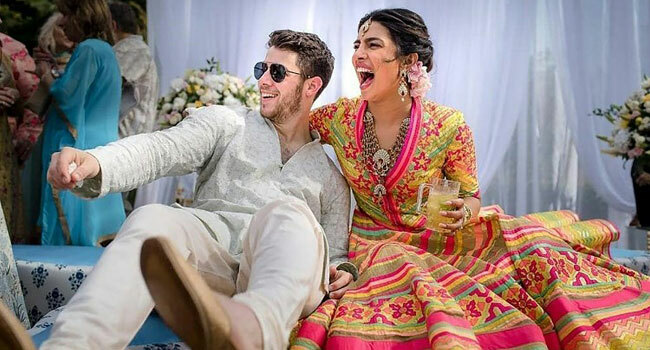 The multi-day festivities — dubbed India’s “wedding of the year” — continue Sunday with a Hindu ceremony for Chopra, 36, and Jonas, 26. “One of the most special things that our relationship has given us is a merging of families who love and respect each other’s faiths and cultures,” Chopra posted on her Instagram account on Saturday. “Ralph Lauren is honoured to have dressed the couple as well as the members of their wedding party,” the designer posted on Twitter on Saturday. The wedding celebrations commenced with a traditional Indian “mehndi” ceremony, with Chopra’s arms and legs intricately painted with henna dyes. In recent years, Jonas remodelled himself with a more mature and edgy image and has also turned to acting.